The Weber cooking grate is made of porcelain-enameled cast-iron and fits the Genesis Silver A and Spirit E-210 gas grills. 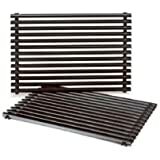 Weber 7522 Cooking Grate (UPC 077924074356) is sold at the following online stores. We've find the latest prices so you can compare prices and save money when making your purchases online. Please click on the links below to browse to each store's webpage.